Dynamite Entertainment and Dark Horse Comics are proud to announce that Red Sonja, the fearless She-Devil with a Sword, and the legendary adventurer Conan the Barbarian will team up once again in an all-new comic book miniseries, Red Sonja / Conan. 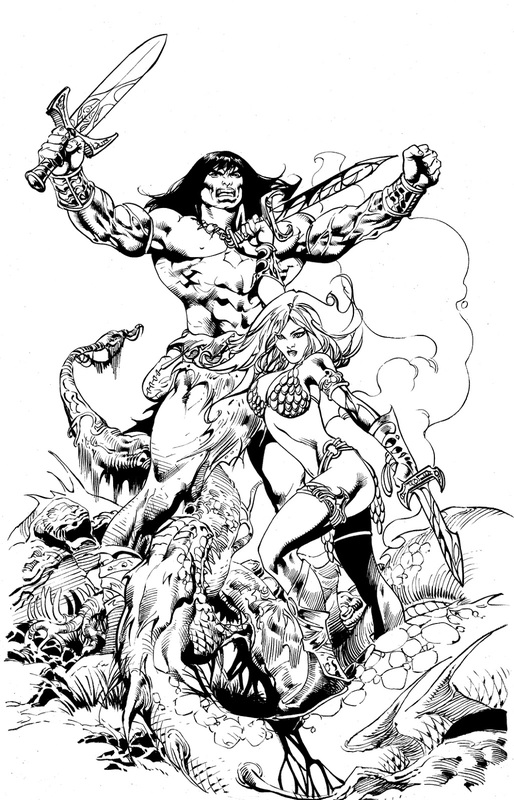 Following upon the success of the Conan / Red Sonja crossover released in January 2015, the new launch welcomes celebrated author Victor Gischler as the series writer. Red Sonja / Conan will debut this summer with a #1 issue featuring cover artwork by Alex Ross, Ed Benes, and Roberto Castro. In Red Sonja / Conan, the crimson-tressed warrior and Hyborian berserker are reunited during an impromptu tournament of arms, a festive occasion that unexpectedly gives way to supernatural menace. The famous fantasy pair -- known for their camraderie in battle, the fiery tension of an unspoken passion, and the occasional rivalry towards each other as respected peers -- must unite to face a horde of demons set loose upon the land. 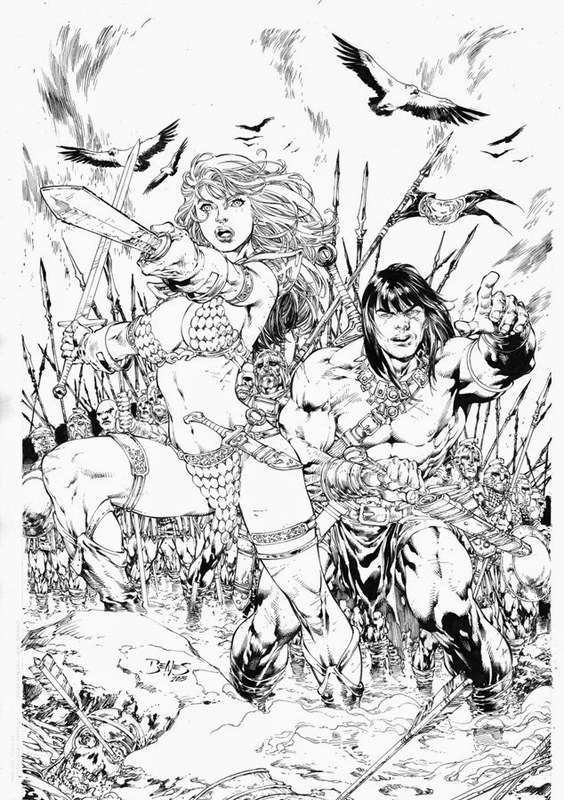 While the events of Red Sonja / Conantake place one year after the continuity established in the Conan / Red Sonja series of early 2015, the script has been carefully constructed to appeal to returning fans and newcomers alike. "I'm very excited to be working with two amazing iconic characters like Red Sonja and Conan. It's also pretty awesome that two comic publishers like Dynamite and Dark Horse can come together to make something like this happen," said writer Victor Gischler "I think we're in for some top notch high adventure." Victor Gischler, a bestselling novelist and comic book writer, has written adventures set within the swords-and-sorcery world of Robert E. Howard previously, in the form of a five-issue Dark Horse miniseries called Conan: The Phantoms of the Black Coast. Red Sonja / Conan marks the writer's first time writing the She-Devil with a Sword, although he has worked hand-in-hand with Dynamite Entertainment twice before, with an acclaimed run on The Shadow and its spin-off series, Noir. Gischler's extensive work in the comic book industry also includes two stories set with Joss Whedon's Buffyverse (Spike and Angel & Faith), as well as popular Marvel superhero titles The Punisher, Deadpool, and X-Men. "Pairing up Red Sonja and Conan the first time was so much fun, we just had to do it again," says Dynamite Publisher and CEO Nick Barrucci. "The two have such an interesting history in comics between them, dating back to the late 1970s, and it seems that more than just sparks are destined to fly whenever this pair of star-crossed warriors meet. We at Dynamite are very proud to work alongside our friends at Dark Horse Comics to reunite these icons, and to deliver the best fantasy comic books ever made available on store shalves." "We're extremely excited to see Dynamite complete this adventure fifteen years in the making between these two classic characters," says Dark Horse President Mike Richardson. "Dynamite has been a fantastic partner to work with on this critically acclaimed series and no doubt their story arc will be an excellent contribution to the Robert E. Howard legacy." 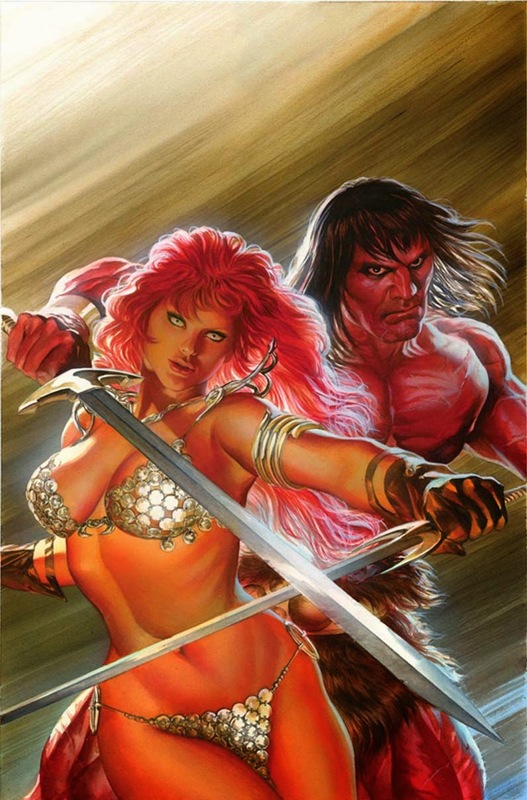 The new Red Sonja / Conan miniseries is slated for release beginning in Summer 2015. The current Conan / Red Sonjaseries, co-written by Gail Simone and Jim Zub, and featuring artwork by Dan Panosian, is available for purchase in stores now from Dark Horse Comics and Dynamite Entertainment. Fans are encouraged to look for new announcements on Twitter, Facebook, Tumblr, and Instagram as the latest updates become available.